No, not a CD-release party, although jazz music will be played live. It’s a book-signing party, the author of which is central to the band. Anthony Smith’s back in town after four years in New York. Some may remember him as keyboardist in a red-hot pop/rock band called the Mighty Untouchables. Or, as a straight-ahead jazz pianist. Smith says he reinvented himself while in New York. 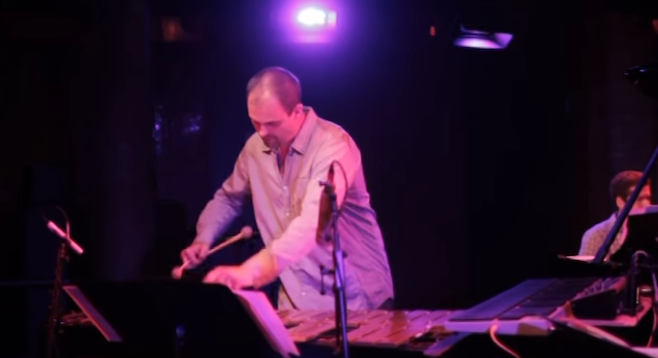 “I put the focus on the vibraphone,” he says by phone. He and his wife and kids live near Lake Murray now. “I was a pianist who dabbled in the vibes.” Now, he says it’s the other way around. Saturday, January 13, 2018, 8 p.m. But, the Big Apple: “It was a cool situation for me to develop a whole new network. And I got to play with world-class guys.” Some of them ended up in his book. And it follows that music by the artists profiled will be showcased, with Carlos Cuevas on piano, drummer Fernando Gomez, and bassist Mackenzie Leighton.